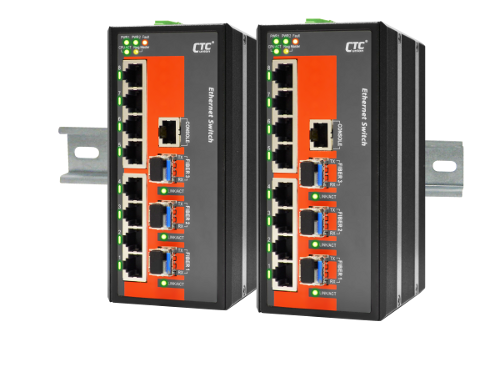 The IFS-402GSM-4PH24 series models are managed industrial grade Ethernet PoE (Power over Ethernet) switches with 4x10/100Base-TX PoE ports and 2x100/1000Base-X SFP ports with 4xPoE+ that provide stable and reliable Ethernet transmission. With dual power input design, the series models can provide redundancy mechanism for critical applications that need always-on connections. These switches can also operate either at standard operating temperature range (-10 to 60°C) or at wide operating temperature range (-40 to 75°C) so as to fulfill the special needs of industrial automation applications. Housed in rugged DIN rail or wall mountable IP-30 enclosures, these switches are perfect choices for harsh environments, such as industrial networking, intelligent transportation systems (ITS) and are also suitable for many military and utility market applications where environmental conditions exceed commercial product specifications. 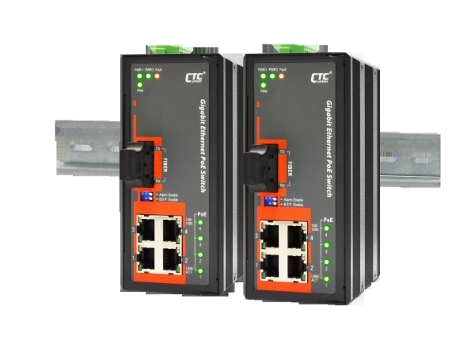 Apart from specially-designed outlook and hardware features, the Ethernet switches also support a wide variety of management functions, including STP/RSTP/MSTP/ ITU-T G.8032 Ring and multiple u-Ring for redundant cabling, advanced PoE management functions such as PoE device auto-checking and auto reset, PoE power on/off weekly scheduling, layer 2 Ethernet IGMP, VLAN, QoS, Security, IPv6, bandwidth control, port mirroring, cable diagnostics and Green Ethernet. The IFS-803GSM-8PH24 Series are Fast Ethernet managed PoE+ switches that come standard with 8 ports 10/100BaseT(X), with ports 1 to port 8 compliant with IEEE802.3af (PoE), and 3 SFP Gigabit/Fast Ethernet ports. 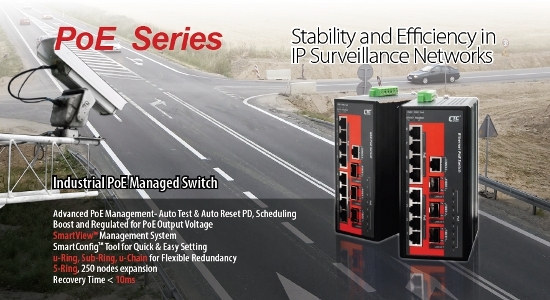 The IFS-803GSM-8PH24 series Ethernet switches provide up to 15.4 watts of power per PoE port for industrial heavy-duty PoE devices, such as weather-proof IP cameras, high-performance wireless access points, and rugged IP phones. 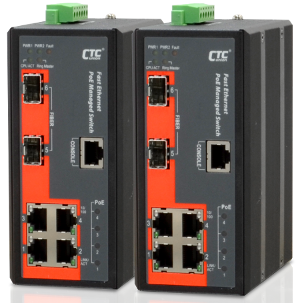 The IFS-803GSM -8PH24 Ethernet switches are highly versatile, support 24/48VDC power input booster, and are able to fit all the common 24/48 VDC power systems found in industrial fields or cabinets. The Ethernet switches support a variety of management functions, including STP/RSTP/MSTP and ring <50mn recovery time, PoE power management, PoE device auto-checking, PoE power scheduling, IGMP, VLAN, QoS, bandwidth management, and port mirroring. The IFS-803GSM-8P24 series is designed especially for security automation applications with high EMS immunity to ensure uninterrupted reliability of PoE systems such as IP surveillance, passenger information systems, auto gate entry system which can benefit from a scalable backbone construction and Power-over-Ethernet support. 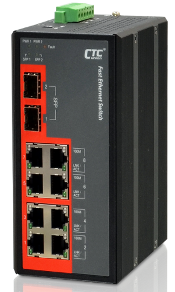 The IFS-1608GSM-8PH are managed industrial grade ethernet PoE (Power over Ethernet) switches with 16 x 10/100Base-TX PoE ports and 8 Gigabit/Fast SFP ports that provide stable and reliable Ethernet transmission. With dual power input design, the IFS-1608GSM-8PH can provide redundant mechanisms for critical applications that need always-on connections. This switch can also operate either at standard operating temperature range (-10 to 60°C) or at wide operating temperature range (-40 to 75°C) so as to fulfill the special needs of industrial automation applications. Housed in rugged DIN rail or wall mountable IP-30 enclosures, these switches are perfect choices for harsh environments, such as industrial networking, intelligent transportation systems (ITS) and are also suitable for many military and utility market applications where environmental conditions exceed commercial product specifications. 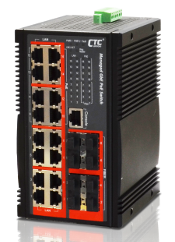 These managed switches also support a wide variety of Ethernet functions, including STP/RSTP/MSTP/ ITU-T G.8032 ERPS and multiple μ-Ring for redundant cabling, advanced PoE management functions such as weekly PoE power scheduling as well as device auto-checking and auto-reset. They also support layer 2 Ethernet IGMP, VLAN, QoS, Security, IPv6, bandwidth control, port mirroring, cable diagnostics and Green Ethernet. The IGS-402SM-4PH24 series models are managed industrial grade Gigabit PoE (Power over Ethernet) switches with 4 ports 10/100/1000Base-T PoE ports and 2 ports Fast/Gigabit Ethernet SFP ports that provide stable and reliable Ethernet transmission. With dual power input design, the series models can provide redundancy mechanism for critical applications that need always-on connections. These switches can also operate either at standard operating temperature range (-10 to 60°C) or at wide operating temperature range (-40 to 75°C) so as to fulfill the special needs of industrial automation applications. Housed in rugged DIN rail or wall mountable IP-30 enclosures, these switches are perfect choices for harsh environments, such as industrial networking, intelligent transportation systems (ITS) and are also suitable for many military and utility market applications where environmental conditions exceed commercial product specifications. 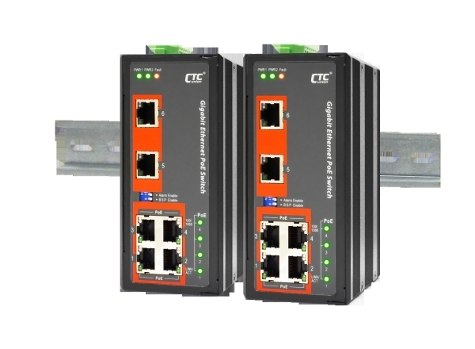 Apart from specially-designed outlook and hardware features, the Ethernet switches also support a wide variety of management functions, including STP/RSTP/MSTP/ ITU-T G.8032 Ring and multiple u-Ring for redundant cabling, advanced PoE management functions such as PoE device auto-checking and auto reset, PoE power on/off weekly scheduling, layer 2 Ethernet IGMP, VLAN, QoS, Security, IPv6, bandwidth control, port mirroring, cable diagnostics and Green Ethernet.